Smudge has the right idea. I’m talking the next few days off and probably won’t be back until January 2, 2019. That’s next year! Just in case you didn’t know. I hope you enjoy these next few days of seasonal downtime and that your new year is bright and full of hope. See you on the other side. 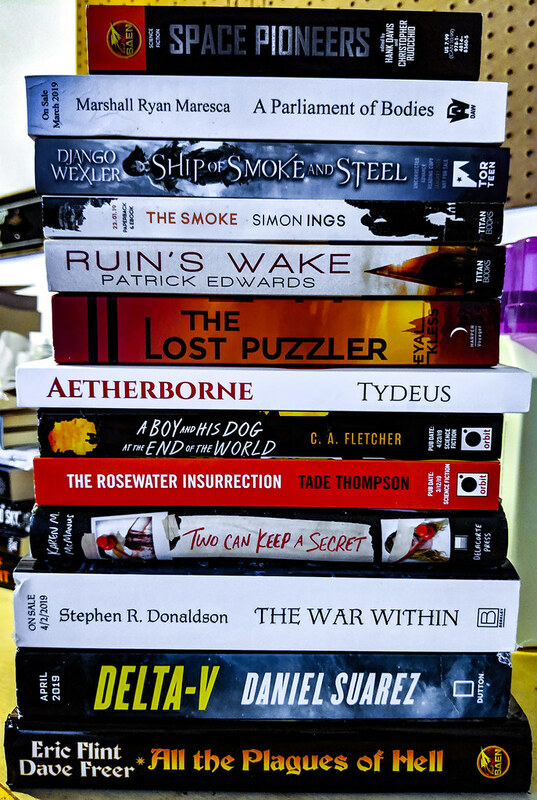 It’s the final stack of new books and ARCs for 2018, so it’s no surprise it’s a big one. What here would you be happy to help you bring in the new year? Tell us all in the comments. Hey, remember when The Consuming Fire was supposed to have been titled The Widening Gyre? 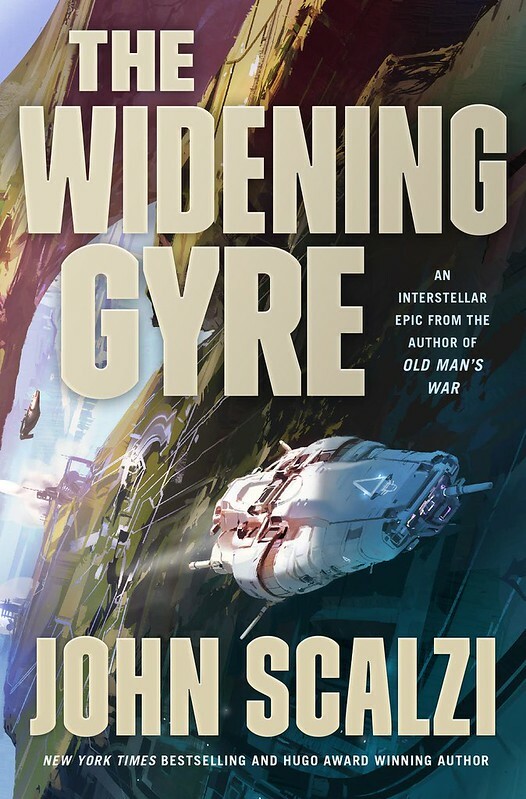 It turns out that both my US and UK publishers kind of hated that title (not the least because no one could agree on how to pronounce the word “gyre”), so we changed it. I have to say now I much prefer the newer title, in no small part because I was able to slip it into a major character’s big speech, which gave the new title that “hey, we meant to do that all along” vibe. Which I guess is one nice thing about having turned in the manuscript at the very last possible instant. It all worked out pretty well in the end. 3. The Dispatcher, released two years ago, showed up on the inaugural New York Times audio fiction bestseller list as well, so, again: Nice! This means I had three New York Times best sellers in a single calendar year, which, you know. That’s pretty nifty. I’m not going to expect that to be an annual event, but I’m going to enjoy it in the moment. These books also showed up on other bestseller lists too. It’s nice to have evidence people are buying one’s work. 4. Virtue Signaling did not hit a best seller list of any sort, but it did sell out of its entire hardcover print run, before its official release date (which will be, uh, next Monday), and the eBook version seems to be chugging along nicely. Virtue Signaling’s release means it’s a three book year for me — six if you count the limited edition of The Human Division and the paperback releases of The Collapsing Empire and Unlocked, eight if you count my appearances in the Robots vs. Fairies and Resist anthologies — which is a pretty decent number of books out in a calendar year. 5. The Collapsing Empire won the Locus Award for Best Science Fiction Novel, which was pretty great, and was nominated for the Hugo Award as well, coming in second to NK Jemisin’s The Stone Sky, which is also pretty great and I think the correct relative placement of those two particular novels. Head On also made the final round of the Goodread Choice Awards in the science fiction, which was won by VE Schwab this year, which pleases me because she’s pretty great. 6. The various film/TV productions are progressing nicely, some more than others, which is the nature of this particular beast. 7. I got to travel quite a lot this year and see a bunch of friends, which made me happy. 8. I remained married to the most fabulous person in the world, which also made me happy. 9. My kid interned on Whatever, which I really enjoyed, and which I think was useful for her. 10. Once again, I was not consumed either by fire or bears. So, thanks, 2018! You did well for me. Sorry about all the rest of the year not related to me, but, well. I’ve been working on that, along with lots of other people, and we can hope 2019 will see things improve a bit. Speaking of 2019, what’s on the professional agenda for that upcoming year? 1. The sequel to The Dispatcher, provided I finish it soon (and it will be finished soon! I swear). 2. Another book, most likely a collection, the details of which are to come later. 3. The paperback releases of Head On and The Consuming Fire. 4. Re-releases of Agent to the Stars, Fuzzy Nation and The Android’s Dream, with nifty new artwork and introductions by me. 5. Appearances in London, Budapest, Aviles (Spain) and Dublin (and suburban Detroit). 6. A short story (with accompanying animation) that will appear in The Verge in January. These are all the solid things. Beyond the things that are entirely solid I have a bunch of stuff that’s in various stages of negotiation and/or development, which I hope to be able to share with you soon(ish). When I can share them will be in no small part dependent on other parties. But you’ll know when I know. But what about a novel? I hear you ask. Well, I’m writing one in 2019: The Last Emperox. Provided all the production marks are hit, it’ll be out in the first half of 2020. Oh, don’t give me that look. You got two novels in 2018. And you’ll get The Dispatcher 2 in 2019. You’ll be fine. Other people are writing novels in the meantime. Read some of those while you wait. Also, I’ll be turning 50 in 2019. That’s a hell of a thing. So in sum: 2018! Not bad for me! 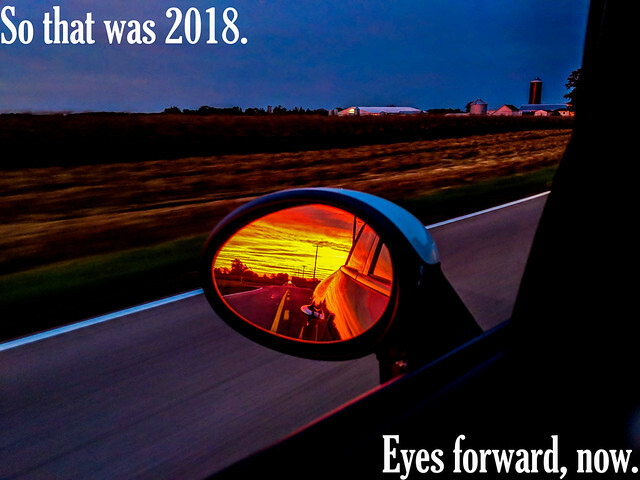 Let’s hope 2019 is even better. Let’s get to it. Every year I post stats on traffic for Whatever, and every year it gets harder to see how it accurately reflects my actual readership, because of the way people read things I post here. Bluntly, relatively few people visit the site directly at this point in time — As of this moment, for 2018, Whatever has had 2.82 million direct visits in 2018, down from last year’s 4.1 million, and substantially down from the 2012 high of 8.16 million. At the same time, Whatever has 30k+ followers through WordPress and email, another 10k+ on Feedly and other RSS aggregators, a few thousand though social media feeds, and there an unknown number of people reading the site’s content on mobile, through AMP versions of the site. None of those impressions/reads get tracked through the WordPress stats suite. What I can say is this: The majority of Whatever readers don’t read its content directly on site anymore. This has been true for a few years at least, but has become especially noticeable in the last couple of years. I don’t have a real problem with this — I don’t really care how you read stuff I post on Whatever, I’m just glad you do — but I do miss having a better statistical read on what pieces of mine are resonating with people. Stats are difficult in the fractured reading reality of 2018. Also, 2018 continued 2017’s trend of (relatively) fewer posts on the site: Counting this one, there were 475 posts on Whatever this year, a bit up from last year (452), but below the average for most years. I chalk this up to being busy and also mostly avoiding political posts this year (because as noted elsewhere, there are only so many ways of saying “He’s a bigoted crook!” and keeping it interesting in a longer format). Regardless, there is a pretty solid correlation between number of posts and number of visits. Write fewer posts, you’ll generally get fewer visits. It makes sense. Once again, social media’s dominance of the Internet is underscored by the fact that the two top sites that send traffic to Whatever (not counting Google searches) are Twitter and Facebook, with the former sending four times as much traffic (which makes sense as I am rather more publicly active there). After that it’s WordPress, Goodreads, Hacker News and Reddit. No individually-owned site shows up in the top ten; File 770, a science fiction news blog, shows up at number 14. From a traffic-driving point of view, the “blogosphere” continues to be greatly diminished from its heyday. Outside of Whatever, and in what will be absolutely no surprise to anyone, Twitter remains the place where I see the most social media action, in terms of followers and impressions: As of this morning, 293.8 322.5 million impressions (up from 269 million in 2017; and number updated to reflect I left out a month when I added it all up) off of 15,346 tweets (down from 17,059 in ’17), with 157,909 followers, up 24,149 from last year’s count of 133,760. My Facebook fan page is up to 22k followers, from 20.5 last year, so that’s nice. I’ve stopped counting Google+ followers because that site’s going away anyway. I have a few thousand followers on other social media sites, but I use those only sporadically so I don’t tend to think about them, stats-wise. Again, this year, Twitter is where it’s at for me, social media-wise. For 2019, I suspect I will continue to do what I’ve done in 2018, which is to use Twitter for short-form, immediately-reactive bits (Twitter was where most of my political fulmination went this last year, as it’s been best suited to my mood), and Whatever for longer pieces and bits that I don’t want to have disappear down social media’s memory hole. I said last year that I wanted to write more Whatever pieces, but 2018 included two novels and two book tours and a bunch of travel and other work, so that didn’t quite pan out. Let’s see what 2019 has in store. I’m looking forward to it. And if you celebrate it, I hope it’s a wonderful day for you and those you love. Merry Christmas! Well, that was a year, wasn’t it: a dark cloud of crap with a silver lining in the November elections. I’m kind of hoping it represented the bottom and that 2019 sees us clawing our way back toward the light, but, well. We’ll see, won’t we. In the meantime, here’s a collection of some of my best pieces here on Whatever this year, if you missed them the first time, or just want to relive them in all their glory. It’s relatively light on pieces specifically about Our Dim President, because 2018 was the year I more or less said “How many different ways can I say he’s bigoted, incompetent crook?” and chose not to write about him in any great detail. Nevertheless he shows up here and there. He’s part of the landscape, he is. Trump is a Racist. Stop Pretending Otherwise. And to end on a goofy note, meet my parrot son. It was good to get a little goofy in 2018, from time to time. 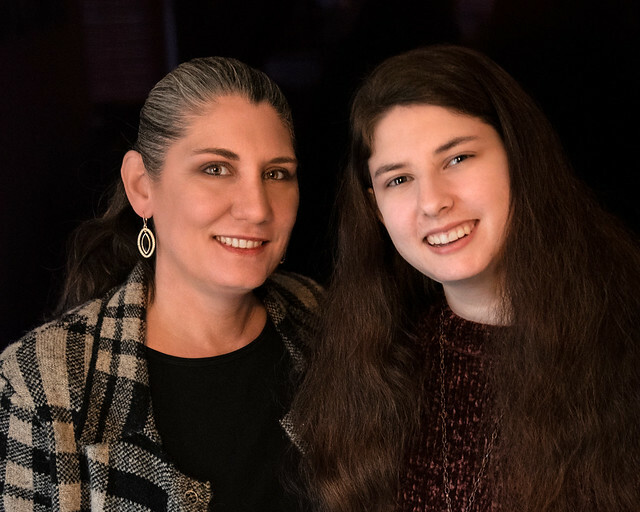 My daughter is officially no longer a teenager. Which, wow, as the kids say, that’s a mood. Please enjoy your Athenamas in a manner pleasing to you. 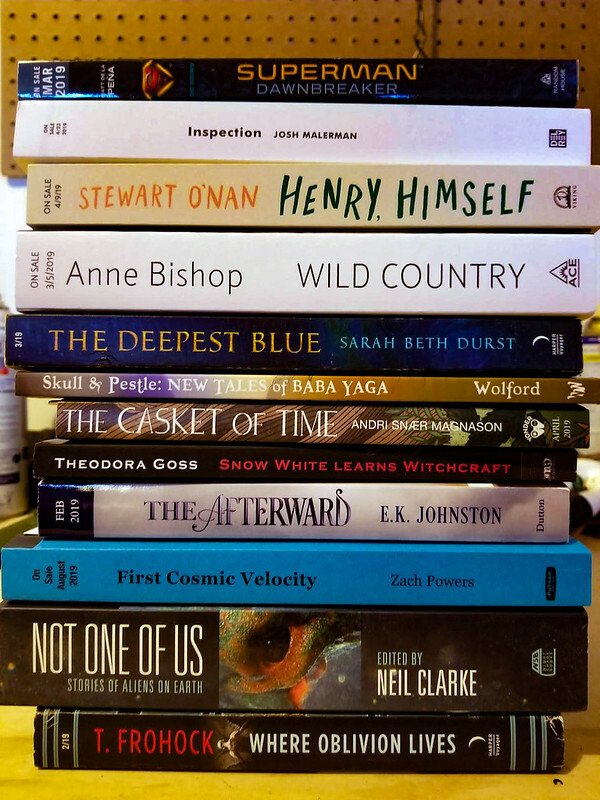 Just in time for your Solstice celebrations and/or last minute shopping, a nice stack of new books and ARCs for your wintertime consideration. See anything here you’d love to have under the tree? The comments are the place to note them! This really happened. All of it. 1. So, true story, which has a point. Last night, I had a dream where I was reading a piece of mail with Athena and Krissy that informed us that we had been awarded a $1,000 arts grant. And we were all "wha"? Because a) we'd not applied for one, b) we did not need it. 2. So, in the dream (and really, this was the actual dream), we looked to each other and said, "Well, obviously we're not keeping this, where should we donate it?" BUT THEN, weirdly, my stomach did a thing and I woke up having an acid reflux moment which scared the actual Krissy. 3. I'm fine, everything's fine, it was just a weird thing. But this morning I remembered the dream and felt like there was the unfinished business of deciding where the donation of this "arts grant" was supposed to go to. Because, don't you hate not knowing how a dream ends? 4. So, this morning I looked around and found @innercityarts, which does art programs for underserved kids in Los Angeles. It's got a four-star rating on Charity Navigator, and having grown up an underserved kid in the LA area myself, has a mission I appreciate and encourage. 5. Which is why that $1000 arts grant in my dream last night has now became a $1000 donation by the Scalzi family to @InnerCityArts in the real world. Now I know how the dream ends! And real kids benefit. All in all, I think this is a good way for a dream to come true. 6. This is my moment to say that you don't have to wait for a dream to encourage you to give to arts-related charities, especially ones that reach out to children and underserved population. Tis the season! It makes a difference. Go give it a thought for your giving this year. 7. Also, as some of you have already surmised, yes, I did have a burrito just before I went to bed, so that was in fact probably the reason for the acid reflux. As it ended with a donation to a worthy charity, I regret nothing. 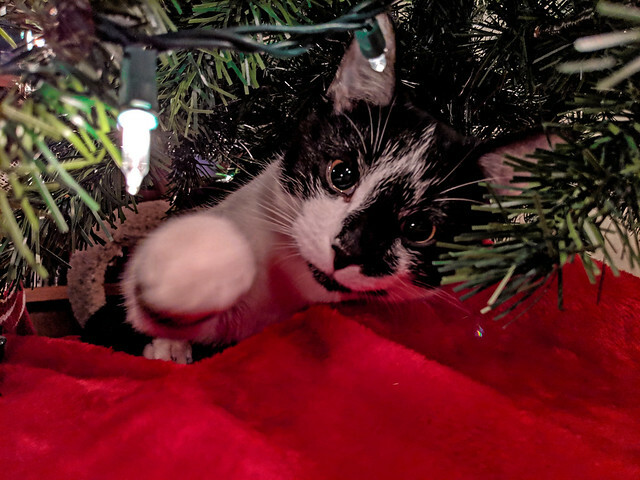 He’s reaching out to you in the spirit of Christmastime cheer! And also for that food you’re eating. Yeah, he’ll take some of that. Isn’t Christmas really about giving? No? Humph. Well, then, expect a special gift under the Christmas tree, if you know what I mean. He’ll make it himself! Please state your name and occupation. My name is Marta Pittman, and I’m a partner at Xavier, Masham, Abbott and Stevens. And you’re Santa Claus’ lawyer. That is correct. More accurately, I’m the partner in charge of our firm’s Seasonal Litigation and Clearances practice, which has as a client NicolasNorth LLC, Santa’s corporate entity. I wasn’t aware that Santa needed to have his own corporation. Of course he does. One, Santa heads a massive global enterprise, whose activities are spread over a wide range of areas. Having a corporate structure allows him a measure of organization and systematization. Two, Santa has a large number of employees, mostly elves, who have their own idiosyncratic employment issues and practices. The corporate structure simplifies hiring, benefits, and negotiation of labor disputes. Three, due to the nature of Santa’s work, he has immense exposure to liability. The corporate structure acts as a shield for Santa’s personal wealth and property. Obviously I can’t speak about current cases under litigation, but let me give a general example. As you know, a common way for Santa to enter single-unit dwellings is through a chimney. I always thought that was artistic license. No, it’s correct. Santa is usually entering from above and the chimney is the most direct route. “Quick in, quick out” is the keyword here. The important thing is, this point of Santa egress is well-known. And every year, immediately after Christmas, dozens of suits are filed against Santa, claiming property damage caused by Santa entering and leaving through the chimney. The usual allegation is that Santa’s body shape was a predicate cause. Because he has a round belly that shakes like a bowl full of jelly. Which is not true, by the way. I’ve seen Santa out of uniform. That dude is ripped. Absolutely. Delivering packages to millions of children in a single night is a heck of workout. The thing is, people don’t know that, and so they file these fraudulent suits predicated on what they assume about Santa’s weight, based on his marketing. I assume most of these suits get dismissed. Usually with prejudice. And also the plaintiffs go onto Santa’s “naughty” list for the next year. Santa takes a dim view of fat shaming, especially for fraudulent purposes. But the point is, since Santa is operating as NicolasNorth LLC, even if one of these suits was successful, Santa wouldn’t lose his house. It’s actually in Sarasota, Florida. It was on our advice. Anchoring a home on rapidly-dwindling polar ice is risky from an insurance standpoint. Also not on the polar ice. Technically in Nunavut. We recently negotiated a 99-year lease near Cape Columbia. Which brings us to another aspect of our firm’s services for Santa: International law. Right, because Santa delivers presents all around the world. Yes, he does. And up until 2013 he had to negotiate clearances and flight paths with every single country on the globe. People think Santa works one day a year and then sits on the beach the rest of the time. In fact until recently he spent most of his non-Christmas time in meetings with mid-level bureaucrats, trying to make sure the toys he was delivering weren’t subject to import restrictions. That doesn’t sound especially jolly. It’s good if you’re racking up frequent flyer miles. But Santa flies his own aircraft, so he wasn’t even getting that. My firm negotiated a rider to the Bali Package at the Ninth Ministerial Conference of the World Trade Organization. As of December 7, 2013, Santa has automatic clearances in every WTO signatory state. Cut his annual paperwork 95%. So now Santa gets to spend time on the beach. There’s a reason he lives in Sarasota. What special employment issues do they have? Well, before I get to that, I should state unequivocally that Santa is an equal opportunity employer, and seeks to create a diverse and welcoming work place for everyone at NicolasNorth LLC and all its subsidiaries and affiliates. He obeys all Canadian employment laws and requires all his sub-contractors and suppliers to adhere to the highest ethical business standards and practices. That’s a very specific disclaimer. There have been unfounded rumors of unfair employment and labor practices at NicolasNorth LLC by some of Santa’s business rivals. Let’s just say that someone whose name rhymes with “Leff Gezos” is going to be getting coal in his stocking until the end of time. And not, like, the good kind of coal. We’re talking the crappiest sort of lignite that’s out there. With everything above taken as read, the thing about elves is that they’re not actually human, so most labor and employment laws don’t apply to them. Okay, so, that feels icky in a whole lot of ways. Maybe Leff Gezos was on to something. It’s obviously not optimal from the public relations point of view. Now I’m imagining tiny elves in jaunty caps, making toys in crates. Well, among other things, Santa’s Workshop is a union shop. Yes. Affiliated with the Canadian Union of Postal Workers. The CUPW is a serious union. You cross them, they’ll mess you up. And the CUPW doesn’t mind the elves technically aren’t human. The elves pay their dues like anyone else. They’re good. Santa’s okay with a union shop? Santa believes in the dignity of labor, and wishes to avoid any potential elf uprisings. Seriously, elves are vicious. They look adorable, but get on their bad side just once and they. Will. Cut. You. 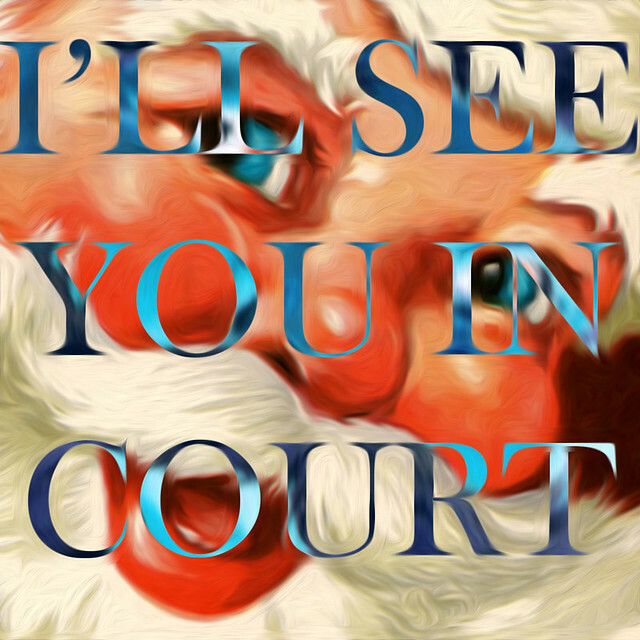 What other legal issues do you help Santa with? Well, one major issue – probably the biggest issue, really – is policing Santa’s intellectual property. Or course Santa has IP. In a larger, existential sense, it could be said that at his root, Santa is nothing but IP. I always assumed Santa was in the public domain. It’s a common misconception. In fact NicolasNorth LLC is the repository of numerous trade and service marks which we are obliged by law to vigorously defend. The red suit device is trademarked. Covered as part of the red suit device and also legally its own trademark. So’s the beard, before you ask. The sleigh and eight of the reindeer and also all of their names, trademarked. The issue of Rudolph is a matter of ongoing litigation and I can’t comment on it at this time. I’m sorry, I really can’t comment. Look, do you want coal this year? Because you’re heading that direction. You say you have to defend Santa’s intellectual property, but I see red suits and beards everywhere. Clearly it’s in Santa’s interest to have his trademarks be ubiquitous. But if people are using your trademarks for free, aren’t you at risk for losing them? Who said they’re using them for free? Absolutely not. NicolasNorth LLC gets a licensing fee for every red suit you see. It’s a sliding scale, based on several factors, including business income, charitable status, intended use of the trademark, and whether the person who is wearing the suit intends to be naughty or nice in it. People are naughty in a Santa suit? Some people are. Santa doesn’t judge people for their kinks, but he does expect them to pay for them. And people pay without complaint. Most do. Some don’t. Which is why Santa retains us. And if they’re still balky after they talk to you? We send in the elves. One more question, if you don’t mind. Santa is well known for making a list, and checking it twice. For the purposes of appropriate gift distribution, yes. It does raise questions of how Santa gathers that information in the first place. I mean the idea of Santa as an all-knowing arbiter of right and wrong, knowing when someone is sleeping or awake and so on. Some might say that’s both judge-y and creepy. Only the people who want coal in their stocking. Well, see, that sounds like a threat right there. I don’t see how, but all right. Let’s say that there were legitimate concerns about Santa’s methods. First, I would remind people that Santa’s services are opt in; you choose whether to have Santa part of your seasonal holiday experience. I don’t remember opting in. Well, you probably didn’t. But your parents did, on your behalf. 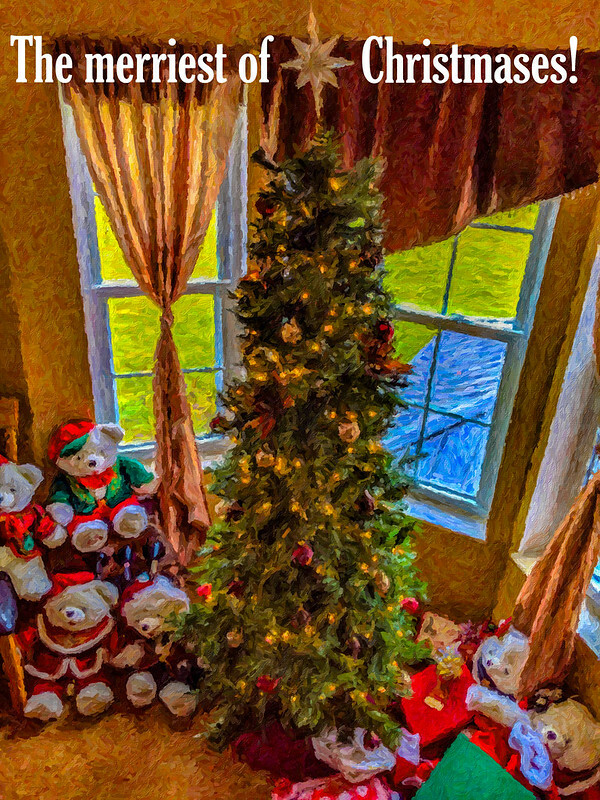 And when they did, part of the user agreement was that Santa – which currently legally means NicolasNorth LLC – is allowed to collect data from various sources in order to make a determination of your gift worthiness, using what we in the industry call the “N/N Matrix”, a multi-dimensional tool using constantly updated algorithms for a precise and accurate placing of each person on the gifting spectrum. That sounds complicated and not great, from a privacy standpoint. I can assure you that NicolasNorth LLC does not share your information with third parties. How does Santa collect this information in the first place? In the old days, kids would write letters to Santa, and we also had strategically placed employees to personally evaluate children. But malls are failing left and right these days. They are, and kids don’t send letters to Santa as often anymore. Those information avenues are closing. Fortunately Santa foresaw this problem, and made some key moves to assure a vast new data source. Jeez, no. Talk about liability issues! And remember, this is supposed to be opt in. Fortunately there’s a place people go these days to voluntarily expose every aspect of their lives in a wildly promiscuous manner the CIA could previously only dream of. Oh, God, you’re talking about Facebook. Six percent owned by NicolasNorth LLC, by the way. You’re saying Santa Claus is a tech billionaire. Like I said, Santa made some key moves. And it wasn’t like he wasn’t a billionaire before. Where do you think Santa gets all that coal? Santa is a coal baron? He’s divested. Mostly. Our advice. Again, liability issues. I’m still unsettled at the idea Santa is data mining my social media posts. He’s legally allowed to. It’s right there in the user agreement. I didn’t read the user agreement. No one reads the user agreement. Doesn’t mean it’s not there. Any final advice for people wanting to stay on Santa’s good side, legally speaking? Pay your Santa suit license fees, drop hints about what your kids want for Christmas in your Facebook posts, and don’t blame Santa if you have a pokey chimney, that’s just basic home maintenance. And be good, for goodness’ sake. And what about you? Have you been bad or good this year? I mean, I’m a lawyer. It’s fine. I could use the coal. 1. I was entertained by Spider-Man: Into the Spider-Verse all the way through, but about two-thirds in, this actual thought surfaced in my brain: Jesus, this film is entertaining. By which I mean that the part of my brain that stores the skills I used for years as a professional movie critic was so impressed by how well this film was put together it felt obliged to comment on it. I was compelled to admire the craftsmanship. I’m not going to say that this is a perfect film, but I can say without fear of contradiction that it’s difficult to see how they could have done a better version of this particular story. There’s very little here that feels out of place, or inessential, or rote and flabby. Given how far we are into the Superhero Era of film, and how ossified its traditions have become (“oh, look, it’s the third act boss battle”), this is a small miracle. 2. It’s also a film where its chosen medium — animation — is exactly right for it. I think there’s a still a bit of aesthetic snobbery around animation, ironically particularly when it comes to superhero films. It’s still assumed to be a compliment if you say something along the lines of “that was good enough to have been live action.” In point of fact, this particular film wouldn’t have been better served as live action; live action and all its aesthetic requirements and expectations would have made it worse. The abstracting remove from reality that animation provides fits the film’s multiverse story and allows it to be a “comic book film” in a way that most live-action superhero films can’t manage or look silly doing (see: Ang Lee’s Hulk). In live action, this film as it is would have come across as campy; in animation, it’s just doing its thing. This is of course more about our own expectations for live action and animation than it is about the mediums themselves. But you work with what you have. 3. Relatedly, it’s nice to see that the conduit between live action and animation can flow both ways. Disney recently has been making “live action” remakes of their animated features to considerable financial success, if not exactly cinematic triumph (ask me sometime to recount all the failures of the live action remake of Beauty and the Beast, and then settle in, we’ll be there for a while). Having one of the Marvel properties head the other direction, and rather more successfully as a creative endeavor, is heartening. I’d be delighted to see more animated superhero films of this quality. 4. I liked that this film (and its filmmakers) were aware of the universe in which we, the audience, live in, i.e., one in which the “superhero origin story,” both in a general sense and how it relates to Spider-Man in particular, is understood and is mostly passe. Spiderman: Homecoming, the most recent live action Spider-Man film, dealt with this by not dealing with it; it knew we knew about Uncle Ben and so on and so forth. 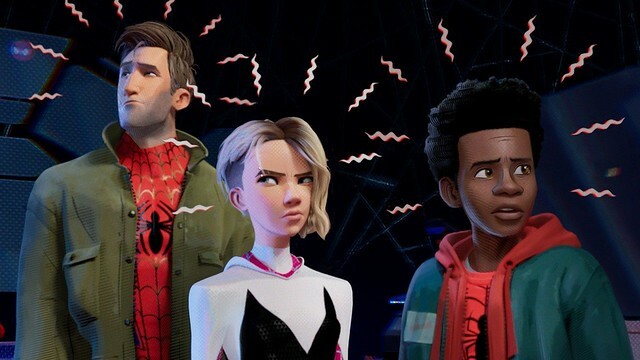 Spider-Man: Into the Spider-Verse can’t just dispense with the origin story, because it actually has to introduce not just Miles Morales as Spider-Man but several others as well. But it solves the problem compactly and cleverly and, again, in a way that works best in an animated medium. In a general sense, this film is knowing: Knowing what we know about Spider-Man and superhero films, knowing what we’re tired of, and working with that to give us the information we need without making a big deal about it. 5. Going into this film, I was aware of Miles Morales as Spider-Man in an abstract sense, but hadn’t read the comics he’d starred in, or knew much about what distinguished him from either Peter Parker or that version of Spider-Man. To that end I thought this movie did a very fine job of setting up all the ways that he is different from, and all the ways he parallels, Peter Parker and that particular iteration of the web-slinger. I really liked his relationship with his family, and how the film made him into an awkward teen but not a loser — Miles Morales has to learn how to be in the world not just as Spider-Man but also as Miles Morales. That’s a lot to convey, and the film does a pretty admirable job. And while other people will better essay Miles’ ethnic background and why it’s important it’s portrayed in film, I’ll just say I’m here for it, and for a view of New York City — and superhero-ness — that’s not just centered on the white experience. In a larger sense, it’s not for nothing that two of 2018’s best films center on a black Marvel superhero, and that those two black superheroes have substantially different challenges they have to deal with, in the course of their respective films. 6. I said on Twitter last night that I thought Into the Spider-Verse might be the best Spider-Man film out there. In the cold light of the next morning, I will continue to stand by that assessment, with the caveat that it’s possibly not the best first Spider-Man movie to watch, since it traffics in the audience’s built-in awareness of who Spider-Man (the Peter Parker version) is and what he’s been through. Without getting into spoiler territory, I think it’s accurate to say that Into the Spider-Verse assumes that you’ve seen the first two Sam Raimi Spider-Man films at least. I figure that’s a not unreasonable assumption. Into the Spider-Verse is arguably the best Spider-Man film; I also think it’s pretty high up there in the rankings of superhero films in general, and it’s also among the best films of the year. I realize that last bit might be contentious, since an animated superhero film does not have the same gravity as, say, Roma. But here’s the thing. Of any film, ask: What is it, in itself, and how well does it realize being that thing? Spider-Man: Into the Spider-Verse is a Spider-Man film, a superhero film and an entertainment. As all of those things, it excels. As I said earlier, it’s hard to see how it could be a better version of itself than it is. And in a year where Black Panther can (and should be) seriously considered for Best Picture accolades, I think it’s pretty safe to argue that another, different superhero film that also hits all the marks it sets for itself can be considered one of the best films of 2018 as well. Again, it’s a craftsmanship thing. So, yeah: Go see it. You won’t regret it. An airband competition from my high school back in 1986, in which roughly half the school is up there lip-syncing to “Do They Know It’s Christmas?” If you’re wondering which one I am, look for the kid air-drumming. That’s me! 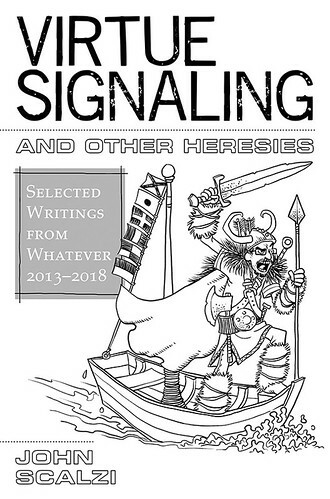 In case you missed the announcement on Twitter yesterday, the eBook version of Virtue Signaling is now out in the world and available, both from Subterranean Press directly, and also from other eBook retailers. The eBook edition is just $4.99, which makes it a perfect “splurge” purchase for you or the people you love, who also love eBooks. Get two! Or six! They’re cheap! No matter how you get this book, it’s a pretty good one. I’m proud of it, and happy it’s out a little early so you can enjoy it before the end of the year. Happy reading! This Friday is basically my last working day of the year, so if you want/need something from me in 2018, you should contact me about it real soon. Like, uh, by Friday. I liked Breakfast With Einstein so much I gave it a blurb, which you can see in the image above. But why did I like it? Because it explores the esoteric realm of quantum physics — here in the everyday world. Here’s the author, Chad Orzel, to dig deeper into it all. Quantum mechanics is one of the most amazing theories in all of science, full of stuff that captures the imagination: zombie cats, divine dice-rolling, spooky actions over vast distances. Maybe the single most amazing thing about it, though, is that we think it’s weird. That probably seems a strange thing to say, because quantum physics is so weird, but that’s exactly the point. These are the fundamental principles governing the behavior of everything in the universe, and yet they run completely counter to our intuition about how the world works. If these are the basic rules underlying everything, shouldn’t they make sense? How can the entire universe behave according to strictly quantum laws, and yet we’re not intuitively aware of it? The answer is that quantum behaviors only become obvious when you’re looking at really small things: the behavior of electrons within atoms, say, or smallish groups of atoms moving slowly. As the things you’re looking at get bigger, their quantum-ness sort of blurs out, and we’re left with objects that, to an excellent approximation, behave according to the rules of Newtonian physics. The everyday, human-scale world, is just too big for us to see quantum physics in action. At least, that’s what we think. If you know where to look, though, you can find hints of quantum physics absolutely everywhere, even in the most mundane of activities. The process of getting up in the morning and getting ready for work or school is absolutely full of phenomena and technologies with quantum roots. Quantum physics got its start in an attempt to explain the red glow of a hot object like the heating element in the toaster you use to make breakfast — to explain that color, you need light to behave like a particle. 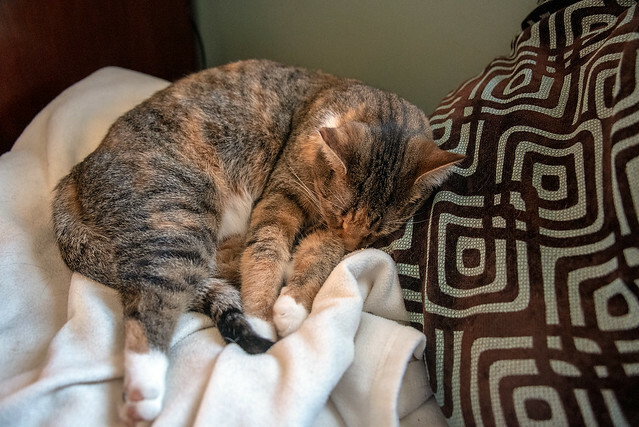 Quantum physics determines the time on the alarm clock that wakes you up, through the cesium atomic clocks that we use to define the second — to make that connection, you need electrons to behave like waves. Quantum physics enables the sensors in the digital cameras your friends use to take cat photos, the semiconductor computer chips used to process them, and the lasers that carry them over fiber-optic telecommunications lines for you to stare blearily at as you sip your morning beverage of choice. At the deepest level, the universe really does behave according to quantum mechanics, and while the huge size of the human-scale world mostly blurs out quantum phenomena, there are subtle hints left behind. That’s how we know about quantum physics, after all– from the work of scientists who spotted those little clues in the behavior of human-scale objects, and doggedly followed them to uncover the fundamental rules that we find so weird. 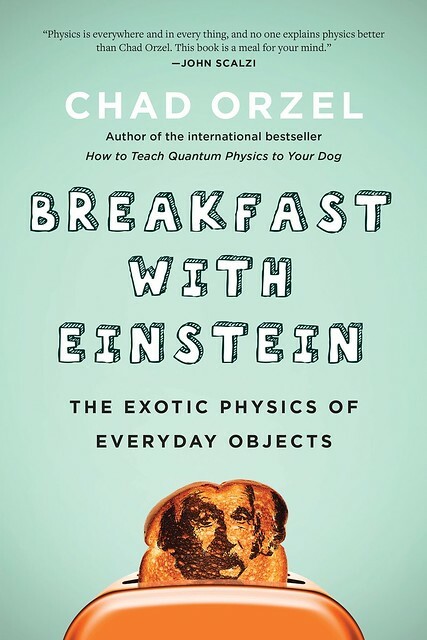 Breakfast with Einstein is a book about those clues, about how quantum phenomena manifest in everything that we do. It explains the quantum rules that govern everything, and how those rules applied to huge numbers of atoms combine to produce the world that we see. And it tells you where to look to see quantum physics in your daily routine. It probably won’t make you a morning person, but it might help make your mornings a little more amazing. Visit Orzel’s writing for Forbes. See his personal blog. Follow him on Twitter. How was it? Everything you would imagine it would be. I will note the tortilla, with the pie inside, was fried in butter and topped with cinnamon and sugar. I ate half of it and am this close to a sugar-induced coma. It is glorious. Now if you’ll excuse me, I have to go sweat butter for a while. They keep coming! Here’s the latest stack of new books and ARCs that have arrived at the Scalzi Compound. What here is something you’d enjoy having in your own hot little hands? Tell us all in the comments. Me: Hey, brain, I think I’d like to write a Whatever piece. Brain: Eh… I’d rather not, thanks. Me: But people are clamoring to know my opinion about many things! Brain: Then they’ll still be clamoring later, won’t they? Me: But — my thoughts on politics! Brain: “He’s guilty and a Russian stooge.” I mean, that’s hardly even a tweet. Me: … okay, you got me there. Brain: Thought so. 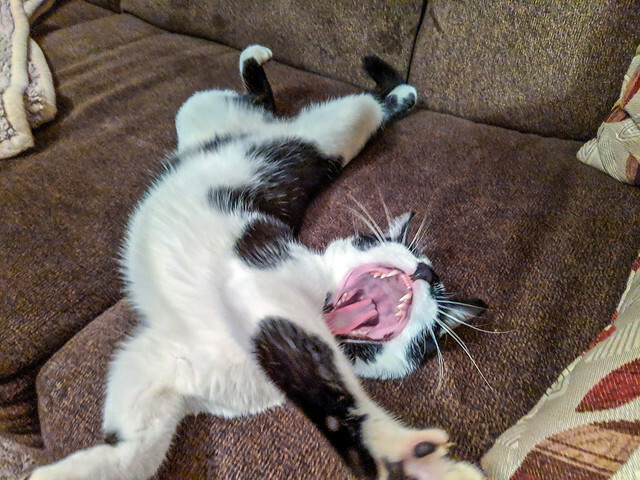 Look, post a cat picture, it’ll be fine. Me: … I see your point. Brain: I thought you might. Me: Fine, but you’ll be back to work tomorrow, right?